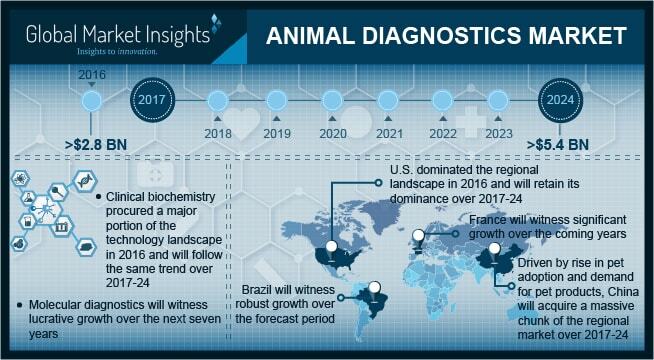 Animal Diagnostics Market size is set to exceed USD 5.4 billion by 2024; according to a new research report by Global Market Insights. Rising prevalence of zoonotic diseases coupled with several initiatives undertaken by public and private players to reduce incidences of animal derived human infections will drive animal diagnostics market over the forecast period. Growing pet adoption for companionship, rising disposable income and substantial increase in pet care expenditure will propel industry growth. Furthermore, rise in demand for animal protein and meat consumption will fuel animal diagnostics market growth. Growing number of veterinary clinics such as Animal Healthcare Center of Florida that offers varied pet services including surgical, medical pet care, wellness programs, hospitalization, behavioral counselling, grooming and others will positively impact business growth. Technological advancements veterinary diagnostics coupled with industry players efforts to develop cost-effective, flexible diagnostic tool capable of delivering faster results will stimulate industry growth. However, low expenditure on pet care in developing economies such as South Africa along with exorbitant cost associated with animal test will hinder industry growth over the forecast timeframe. Hematology segment will witness robust growth over the forecast period. Growing demand for bleeding (hemostasis) analysis, erythrocyte analysis, and leukocyte analysis coupled with rising number of pets suffering from vomiting, weakness, diarrhea, fever, pale gums and loss of appetite requiring hematological tests for disease diagnosis will lead to segment growth. Urinalysis provides valuable information about urinary tract infection in pets especially in small animals including dogs, cats, rabbits, guinea pigs and others. Presence of associations such as International Society for Companion Animal Infectious Diseases providing guidelines for management of urinary tract infection will drive segment growth. Companion animals segment dominated industry in 2016 owing to growing trend of pet adoption coupled numerous efforts undertaken by domestic governments to stimulate growth of animal healthcare sector. Increasing disposable income leading to rise in spending towards pet care will fuel industry growth. Increasing number of well-informed pet owners demanding for superior pet care products, rising spending towards pet care along with growing disposable income will drive UK animal diagnostics market over the coming years. Growing pet adoption coupled with advancements in veterinary diagnostics will stimulate demand for innovative animal diagnostic tools. Growing affection of companion animals leading to rise in pet adoption along with rising demand for premium pet products will drive China animal diagnostics market. Rise in spending over pet care and growing number of veterinarian clinics in the country will positively impact industry growth. Some of the notable industry players operating in global animal diagnostics market are Thermo Fisher Scientific, Abaxis, Heska Corporation, Virbac, IDEXX Laboratories, Zoetis, Randox, Qiagen, and Neogen. Industry players are adopting inorganic growth strategies such as merger, acquisition and strategic partnership to expand their product portfolio as well as consolidate market position. Leading players are focusing on new product development to gain significant market share and sustain its position. For instance, Virbac launched Speed Reader, range of biomarker tests allowing rapid detection of parasitic and infectious diseases in companion animals and cattle in January 2018 in Germany.